This spicy and herbaceous Thai stir fried, one dish meal, known as Pad Prik Gaeng Moo Grob has an amazing blend of flavors and aromas from fresh lemongrass, galangal, kaffir lime, and dry roasted cumin, coriander, and peppercorns. Khun Wood's homemade Prik Gaeng Ped (Red Chili Curry Paste) is quickly fried together with Crispy Pork Belly slices, green beans, carrot, sweet chili, baby corn, and cauliflower, and of course a huge handful of Thai sweet basil. 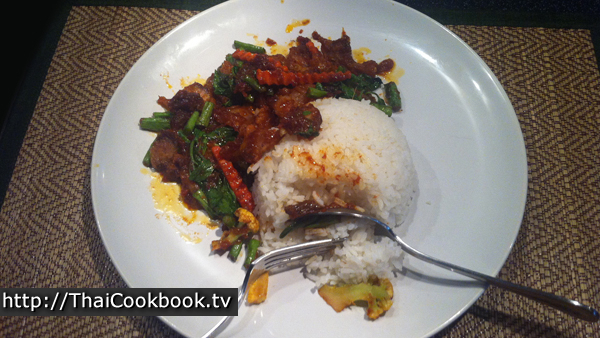 We love this recipe, and really like that he takes the time to make his own Prik Gaeng. 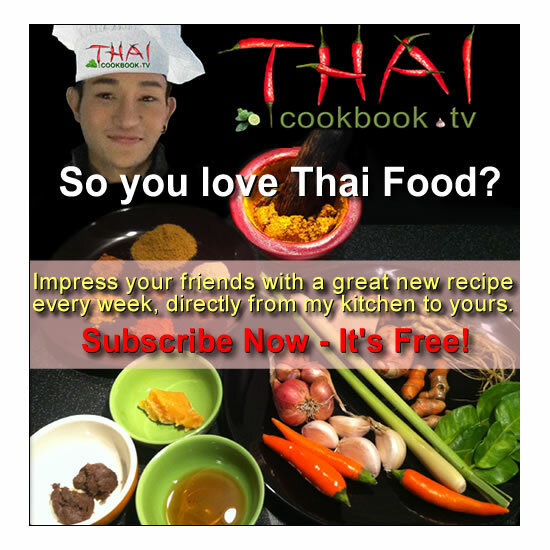 The secret to making delicious Thai food is in the sauces, chili pastes, and curry combinations. 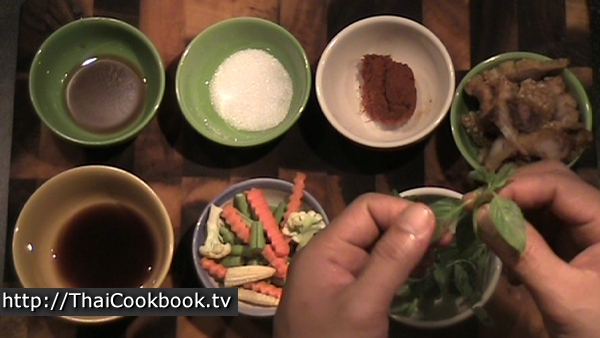 This recipe shows you exactly how to recreate the flavors of Thailand. What's in our Stir-fried Red Chili Curry with Crispy Pork Belly. 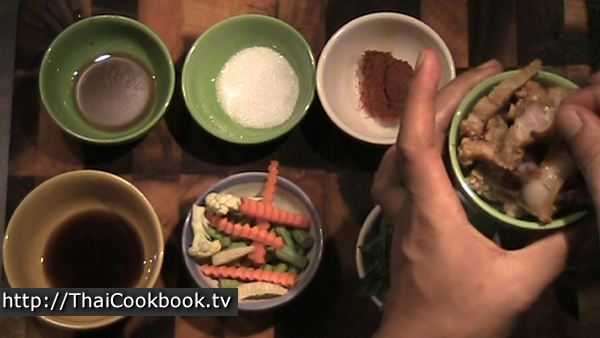 How we make our Stir-fried Red Chili Curry with Crispy Pork Belly. 1) Heat the oil in a wok or large frying pan. When very hot, stir in the red chili paste and let it fry a little. 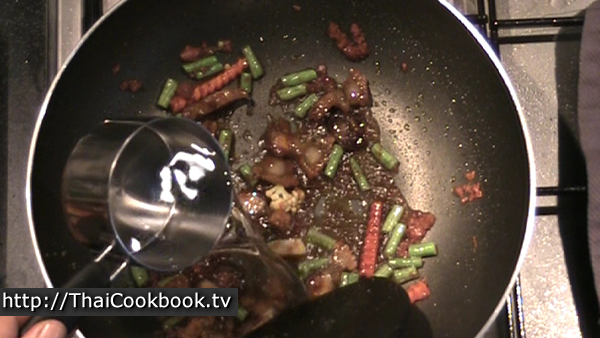 2) Add the vegetables and stir until they are well coated with the chili and oil. 3) Add the light soy sauce and pork belly slices. Fry until everything is hot, stirring constantly. 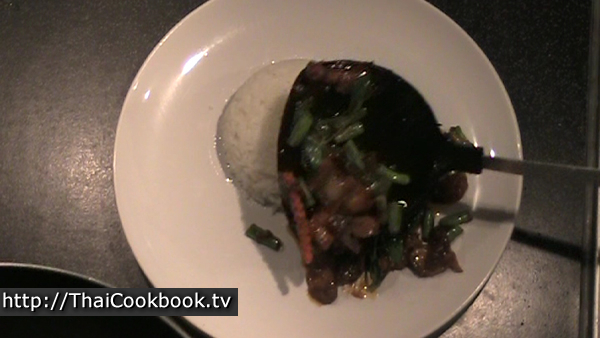 4) Add the oyster sauce and stir in well. 5) Add a small amount of water. 6) Turn off the heat and add the basil. Stir in and serve immediately. 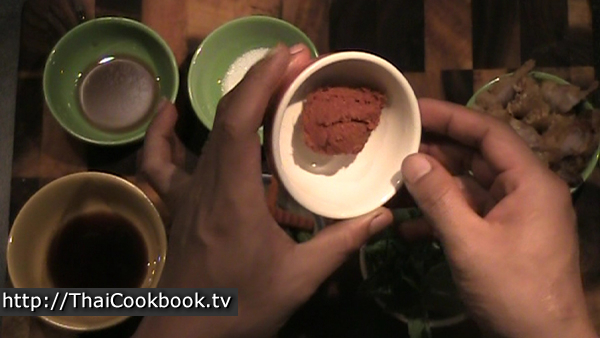 The primary seasoning for Pad Prik Gaeng is Prik Gaeng Ped red chili paste (spicy red curry). It is important to use the right one, as it has toasted coriander seeds, cumin seeds, and white peppercorns. These give the paste a distinct flavor not found basic red curry. 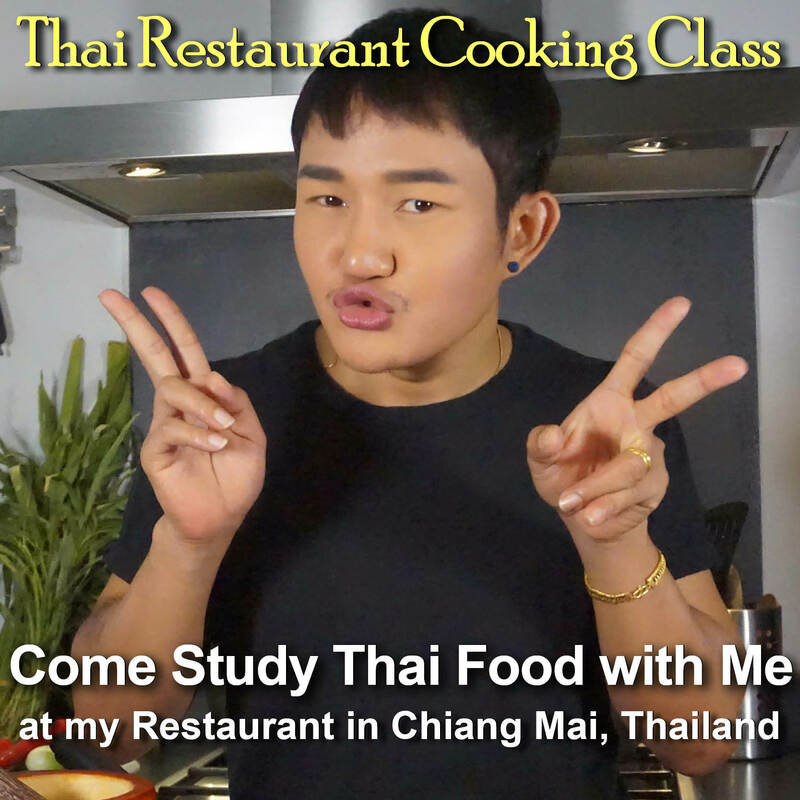 You can make your own with our recipe, or you can buy it pre-made at an Asian market or at an outdoor vegetable market if you are lucky enough to be in Thailand. It is very important that you use the correct type of basil. The one used with spicy chili stir-fried dishes is always the one we call Horapah. Outside of Thailand this basil is often called "Star of Siam". It's the one with purple stems and flower tops, and has a strong scent of anise or licorice. You should not use the one we call Kaphrao (holy Basil,; Hairy Basil), which is used almost exclusively in stir Pad Kraprao. The mint-like flavor of Kraprao does not mix well with the spices in Prik Gaeng, and if you feed it to a Thai they will not like your cooking. 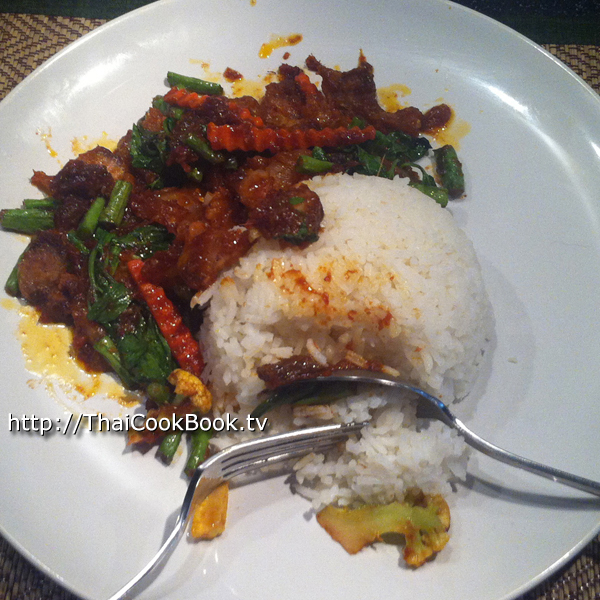 The meat ingredient for this dish is prepared Moo Grob, which is crispy, deep fried pork belly. You'll need to make this well in advance, as it is very time consuming and needs to cool completely before you can slice it. You'll find the recipe here. 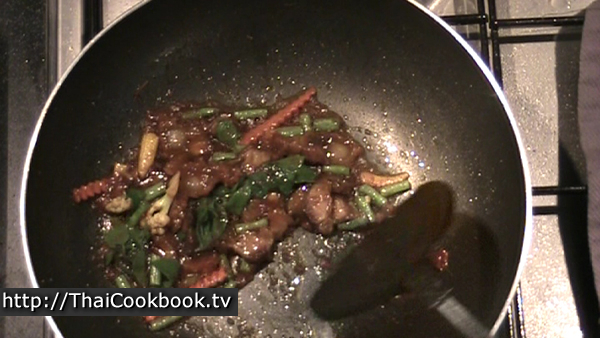 Heat 2 Tablespoons of vegetable oil in a wok or large frying pan. 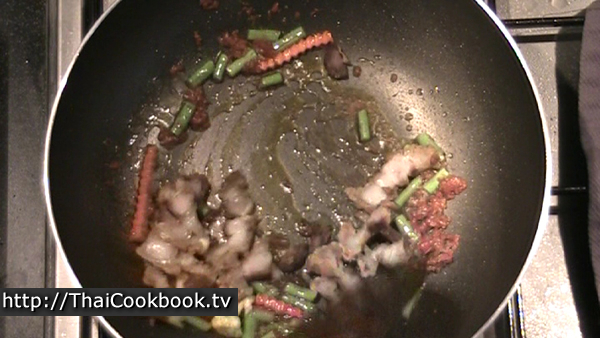 When the oil is very hot, stir in the red chili paste and let it cook a little until it starts to color the oil. Don't worry if the chili does not look it is mixing in, it will smooth out as you add other ingredients. 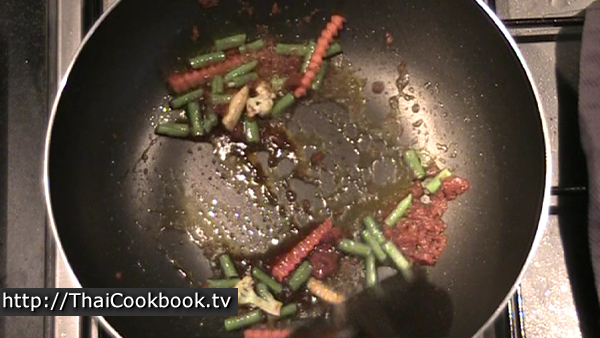 Add the vegetables and stir until they are well coated with the chili and oil. Add the light soy sauce and pork belly slices. Let it cook for a few seconds stirring constantly, then add the sugar and stir until the sugar is all melted. 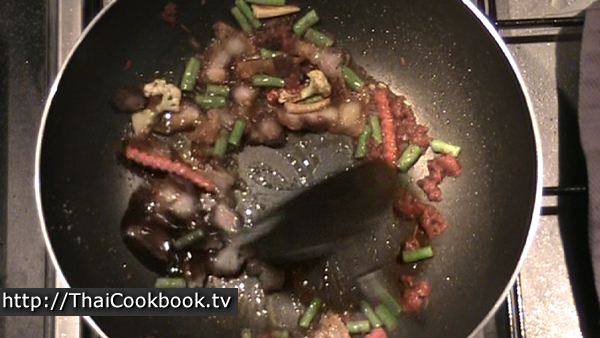 Add the oyster sauce and keep stirring. It will start to dry and thicken now as the sauce and chili get mixed together. Add about 2 tablespoons of water and stir in well. 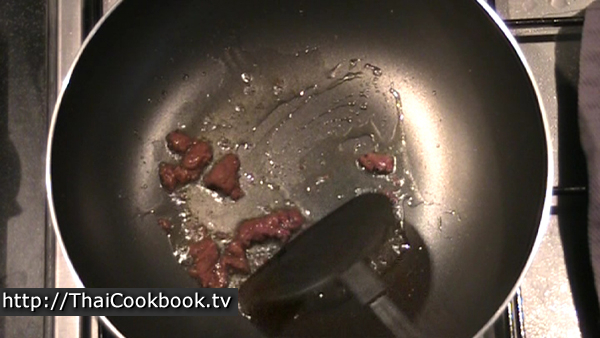 Cook for a few seconds until the ingredients make a nice smooth red-brown sauce. 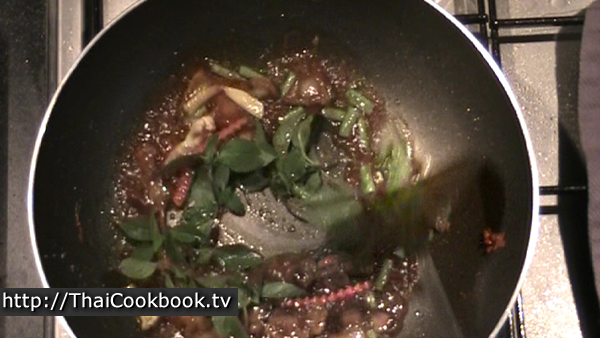 Add the Horapah (basil) to the pan and stir it in quickly to evenly coat it with sauce. Let the basil cook just long enough to be wilted. You don't want this to cook more than a few seconds. Remove from the heat and serve immediately. Serve with steamed Thai Jasmine or other white rice on the side, or on a small plate to be shared if serving a family meal with other dishes. This delicious meal has so much nice color that it needs no garnish, but if you want you can use a few of the Horapah purple basil tops if you have some.